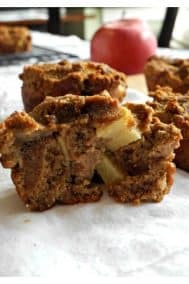 These Paleo apple pie bars have a delicious almond butter crust and crumb top and perfect gooey sweet apple pie filling! 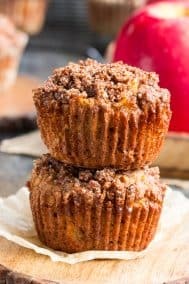 They’re a fun fall dessert to make and eat with kids, gluten-free, dairy-free, paleo and vegan. 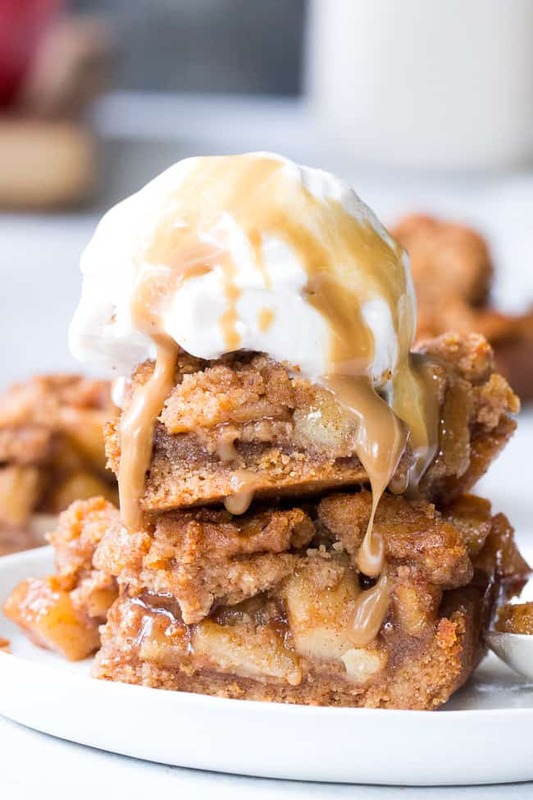 I’m ridiculously excited to finally post the recipe for these apple pie bars. I think I made them in JULY, and they were a one-shot success (YAY!) so, that means it’s been quite a while since actually eating one. In fact, it feels like 2 years ago – at least according to Diana, my 10 year old. Apparently the summer was a long one and these apple pie bars got lost somewhere in the first half. Maybe that’ll teach me to stop trying to work so far in advance – HA! 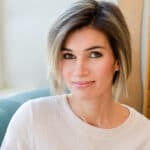 I’m sort of the opposite of a procrastinator and tend to do things too early, then forget about them or get the timing all wrong and don’t know where to fit them in. Or, even more often, decide I hate the photos and decide to do the whole thing over. 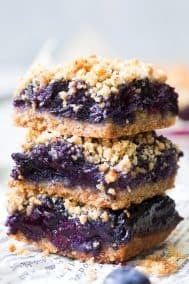 Now, while these apple pie bars are 100% mine, the crust and crumble are based on my almond butter and jelly bars and also soft chocolate chip cookies, which are both out of this world delicious. When you have a good thing, it makes sense to fit it into as many recipes as possible! I figured an apple pie version would be a perfect seasonal spin on those bars, and the final version did not disappoint. 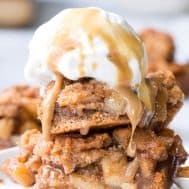 Gooey sweet apple pie filling, almond butter cookie crust and topping, and, if you want to go all-out a la mode, a big scoop of ice cream and vegan caramel sauce. Dangerously delicious is an understatement! 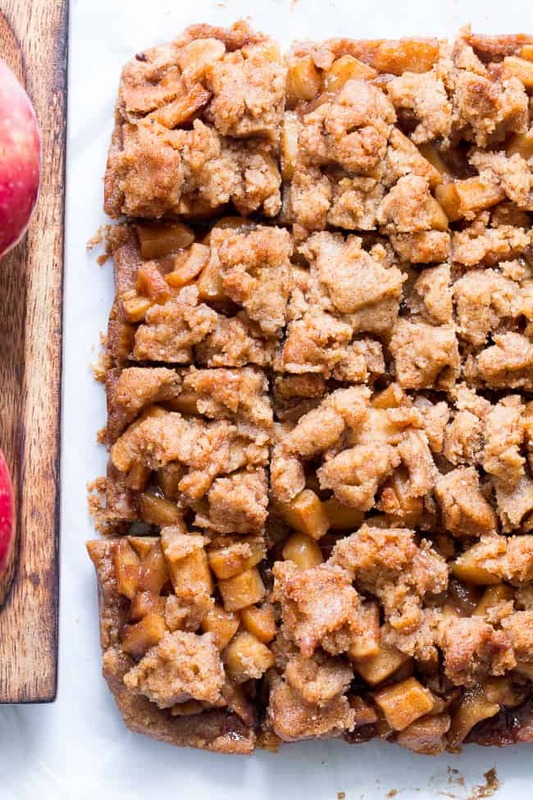 Whether or not you top ’em, these paleo and vegan apple pie bars are going to become a favorite for sure – one even picky kids will love (because even my pickiest did!) and even non-paleo eaters can enjoy. While you can sub in your favorite nut butter, since the crust relies heavily on almond butter, I suggest using one mild in flavor and nice and smooth for the best result. Cashew butter would work really well too. 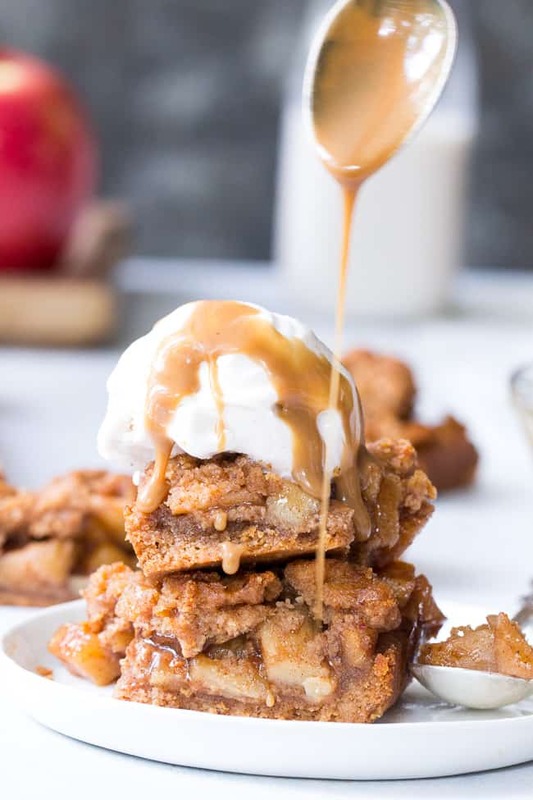 As for the apple filling, you’ll have to do your best to avoid eating it with a spoon before spreading it all over the crust – it’s dessert all on its own! Are you guys ready to bake? Let’s go! These Paleo apple pie bars have a delicious almond butter crust and crumb top and perfect apple pie filling! They're a fun fall dessert to make and eat with kids, gluten-free, dairy-free, paleo and vegan. 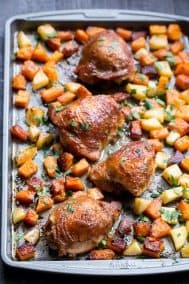 Preheat oven to 350 degrees and line an 8 x 8 square metal baking dish with parchment paper. Combine the water, lemon juice and apples in a medium saucepan and bring to a boil over medium heat, apples should be somewhat softened. In a separate bowl, combine the dry ingredients, then stir into the apple mixture until dissolved and mixture thickens. Remove from heat and set aside to cool a bit. Press 3/4 of the dough into the prepared baking dish lined with parchment paper, chill the remaining dough while you bake bottom crust 7 minutes, then remove from oven. Spread the apple mixture over the partially baked crust, then drop or spoon the chilled crust mixture evenly over the top. Return to oven and continue to bake 25 minutes until top is golden brown. Remove and allow to cool completely before cutting into squares. Combine the coconut cream and coconut sugar in a small saucepan over medium heat, bring to a boil. Once boiling, lower heat so the mixture is bubbling evenly and continue to cook and stir until reduced and thickened, about 10-15 mins. It should resemble dark caramel. Remove from heat and stir in the vanilla and salt. Allow to cool completely before serving. 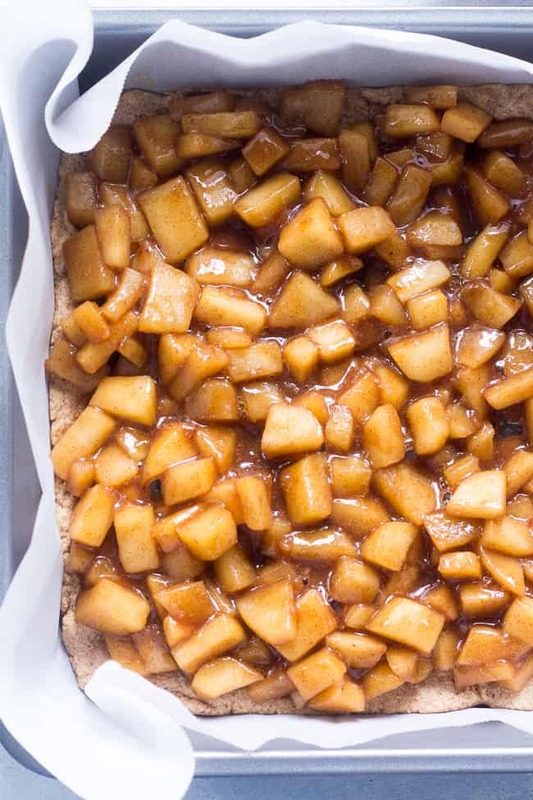 Want More Paleo Apple Recipes? Try One of these! What’s your all-time favorite pie? Should I assume size of pan is 9×9? I will make when I know this and comment! Sorry for forgetting to include! It’s an 8×8″ square metal pan, which you should line with parchment paper. Just updated the recipe so thanks for catching! Sorry – it’s an 8 x 8 inch square baking pan (metal) lined with parchment paper. Just updated the recipe to include that so glad you asked! I too would like the pan size. They look delicious! It’s an 8×8, lined with parchment paper, preferably metal – thanks for catching that I just updated the recipe! 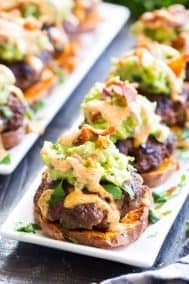 Michele, these look incredible and I really like the ingredient list, too. Hard to believe they’re not made from butter, regular flour and sugar. Also, your husband’s comment is THE ultimate approval. I’ve gotten it from family and friends, too, and it’s the best. These look fantastic! You make the best healthy desserts! 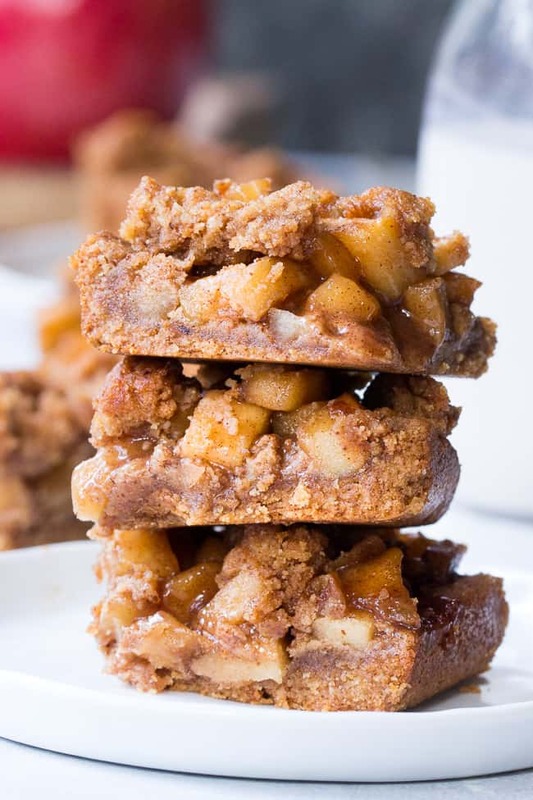 Surprised that these apple pie bars are vegan and paleo. Amazed that you could create such a yummy desert while keeping it vegan. Thanks for sharing this. Your instructions mention adding vanilla to the crust mixture, but there is no listing of vanilla in the ingredients list. Also, the instructions say to add 3 tbsp maple syrup, yet the recipe ingredients state 1/4 cup maple syrup (which equals 4 tbsp). I’m very anxious to try these, but I would appreciate clarification of these two differences. Thank you so much, and thank you for all the incredible recipes you provide for us! Hi! Thanks for catching that, I just fixed both – there IS supposed to be vanilla in the crust mixture and the maple amount is 1/4 cup. I hope you like them! Can’t wait to make these! Do they cut neatly, and could they be eaten out of hand, or is a plate/fork needed? Hi! After completely cooling they’ll cut pretty neatly but I’d still use a plate 🙂 however after being refrigerated they can just be eaten by hand and they’re good both ways. If you’re going to dig in right after baking a plate will definitely be necessary! 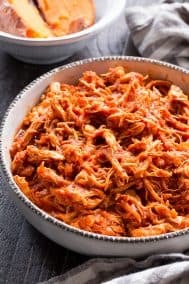 I made this for a dinner of 6 last night and it was a big hit! Easy to assemble. Wonderful flavors throughout. Making right now! The salt and cinnamon in the crust recipe are never mentioned in instructions. Was I supposed to add to crust or topping part only? Mine is already in the oven so I was gonna add to the topping crust. Hope that tastes good. Just wanted to bring it to your attention! Thanks for the recipe! Just updated it, sorry about that! It goes in with the other dry ingredients for the crust/crumble mixture. I am very new to this…like brand new. 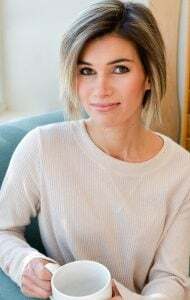 🙂 I have found out that I have several food intolerances and almonds is my highest. 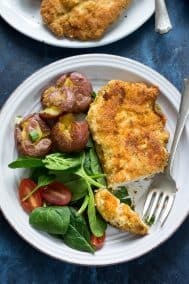 Can coconut flour be used for the whole recipe? I am so hoping to find things that I can enjoy with the intolerances that I have discovered and yet let my body begin to heal. I am really loving your website. Thanks for all the hard work that you do. 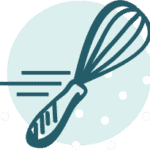 If you’re on a desktop or lap top you can search by keyword on the blog to find recipes that use coconut flour or are nut free. Hope this helps! Can you substitute the coconut flour for anything? For some reason it seems to bother my stomach and throat. If you prefer, I think you can use all almond flour for the crumble mixture, the measurement would likely be up to 2 cups total off almond flour, however, since I haven’t tested it I’m not totally certain. I would say to try using 1 3/4 cups total, and then adding by the Tbsp until you get a very thick cookie dough texture. Again, I haven’t tried it, so can’t promise! I wonder if I replace water with apple juice how would it taste?? I’m thinking it would be fine, a bit sweeter! There’s are some fresh picked apples on my counter that must have been waiting for me to see this recipe! Is there a reason you specify a metal pan? My 8 inch square pan is glass. I always use metal so I’m not sure now the baking time/temp would possibly need to be adjusted for glass. I’m sure it could work, just might need a slight adjustment, possibly needing to bake longer. Do you know if these can be frozen? Just made these! Sooo delicious fresh out of the oven. Wondering what is the best way to store them and how long they’ll last? Thanks!! I store them in the fridge, they should be good for about 3-4 days if they last 🙂 So happy you like them! 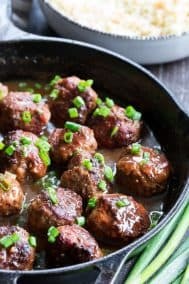 Do these work well as a make ahead? If so, store in fridge only or can they be frozen? Or even just making the crust ahead? Thinking forward to thanksgiving. Thank you! Enjoyed these cold. Maybe because the crust/crumble was hardened. Caramel sauce is definitely a must. They’re definitely good chilled and yes I love that caramel sauce! Would maple sugar work in place of the coconut sugar? Can I freeze them once made? Would they get mushy in the thawing process? Just made these and they smell wonderful. Expecting them to be delicious. One question: my crust/crumble was not very crumbly…..it was more thick and pasty. I melted the coconut oil and wondered if that was the issue here. Should I have added the coconut oil in solid form? ?